The Normandy landfill is Beirut’s new waterfront, an extension to the city’s territory, reclaimed from the sea and filled with the processed debris of Lebanon’s civil war. For Solidere, the private real estate development company running the reconstruction of Beirut’s city center, it is yet another real estate speculation opportunity. With most of the Beirut Central District zoned and designed by international architects and/or imported design strategies, the city’s downtown area is now a failed post-war graft that is closer to an outdoor mall than to a downtown area; a vision of the city that might soon extend onto the virgin land of the Normandy landfill. Squeezed between the city and the sea, this as yet unbuilt area opens up opportunities for an alternative take on Beirut’s waterfront. Solidere views the city as an international commodity, where inhabitants are rendered an optional flavoring to the concept of an aesthetic metropolis. Their vision of a brighter future is a branded park of subjectively-screened monuments designed by international architects. Ours is not. 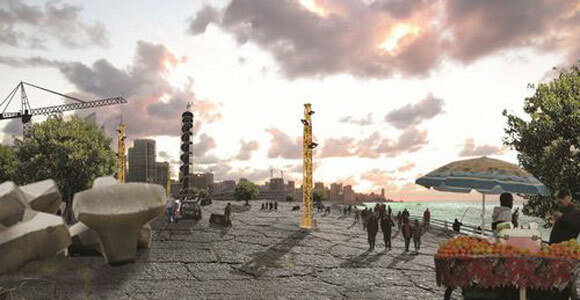 Our vision for Beirut’s waterfront does not blindly copy the real estate extravaganza of the city’s central district. Our vision preserves the intrinsic characteristic of the Normandy landfill: an open space in the continuity of the corniche, Beirut’s densest public space. 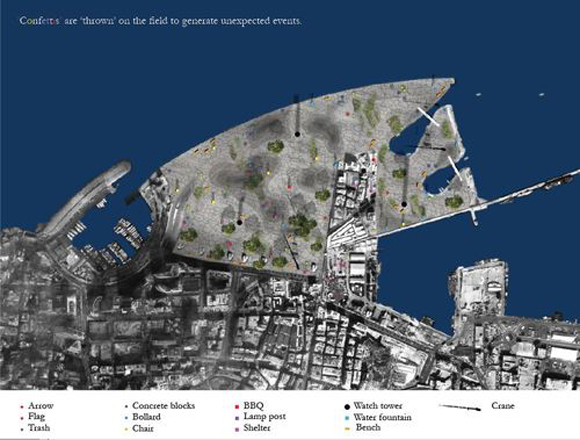 ‘Beirut field’ acts as a catalyst for the underestimated potentials and possibilities of the capital. It does not propose any specific function or use (such as a park, a square or a playground) because each of these intended uses creates a specific set of expectations and denies any other use of the space. 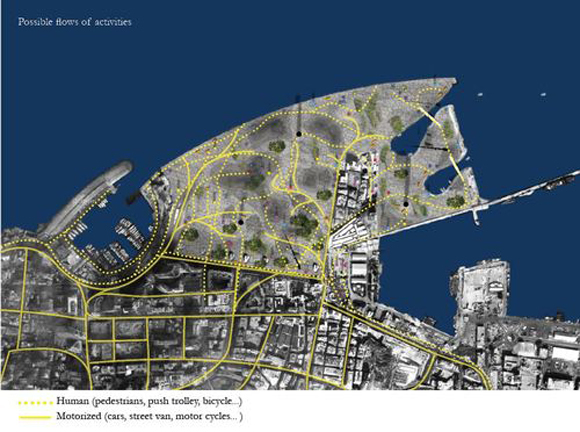 Instead, ‘Beirut field’ generates a raw mineralized space, allowing spontaneous activities and vegetation to develop, leaving its uses open for negotiation, interpretation and imagination…’Beirut field’ intensifies the dynamics that we can already find in-situ, and throughout the city. From above, Beirut can be considered as a patchwork city; each patch having its own history, urban development, laws and social spheres. Instead of continuing the existing infrastructures into the Normandy landfill, ‘Beirut field’ docks into the existing patchwork, intrinsically adding a new patch to Beirut’s urban fabric. The space becomes an interface to the city: from the sea, through a ‘non-planned’ open space, to the hyper-privatized city-center. Yet, the city is given a finger of land to expand deep into the landfill. Around it, the space transforms through constant interactions with its users. 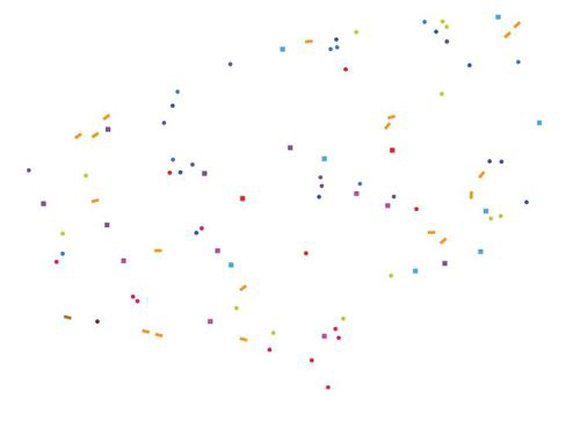 Spatial elements are spread out over its surface like confetti to stimulate these interactions. ‘Beirut field’ thus proposes an approach to the city not through programming and infrastructure, but through a landscape between the city and the sea, a space that is, for once, completely open for interpretation. By replicating elements of Beirut’s not-so-public space in an improvised environment, ‘Beirut field’ brings respiration to Beirut’s saturated urban patchwork. Open space is scarce in Beirut, and often only temporary. Fenced-off vacant lots perforate the built-up fabric, and construction sites open up a temporary chance of respiration, light, and views of the city. ‘Beirut field’ is conceived as a permanently transforming building pit. It opens up spectacular panoramas of the city, the coast, and the peak of Mount Lebanon. Except from a finger of urban development into the site, the surface is entirely covered in asphalt, including the current vacant lots and ephemeral constructions such as Biel. The asphalt allows the surface to constantly transform and adapt. Cracks and deformations caused by the site’s usage and erosion allow for spontaneous vegetation to settle-in, intuitively guiding the circulation of its users. Trees, including the well suited-tree Ficus Nitida, are sparkled across the site, casting, once mature, a comfortable shade for the site’s users. Their roots slowly ripple the asphalt, contaminating the open space. To the east, towards the port of Beirut, the sea penetrates the field, integrating a major body of water allowing fishing boats to access the site. The asphalt provides a neutral surface and an instinctive continuity of the urban ground for pedestrians and cars. ‘Beirut Field’ does not exclude cars nor pedestrians. Both are welcome to float freely wherever possible, between the mineral topography and its confetti of spatial elements creating a pretext for interpretation, uses and improvised circulation paths. 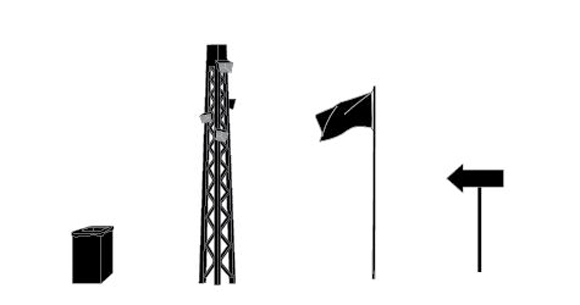 Flag poles, arrows pointing randomly, trash bins, barbecues, benches, shelters, trees, bollards, concrete blocks, watchtowers and cranes are dispersed all over the field, reminding the visitor of the constantly changing city. This confetti of elements stimulates activity and interaction between the space and its users. The effect of these elements is further stimulated by parked cars, fishermen, and street vendors with their trolleys and vans. They generate ever-changing attraction points on the site, in turn drawing more people to the site and effectively creating an ecosystem of spontaneous and improvised activity. Next to fishermen selling fresh fish, kids play or cycle and people walk their dogs. Street vendors sell ‘kaak’ (a local kind of pretzel) or rent out ‘arguileh’ (water pipe) to visitors playing chess and backgammon on the plastic chairs and tables they brought along. Concerts and parties nest in the intimacy of the artificial topography of the site. The space can be appropriated and re-appropriated for any possible public use. Street vendors with their push carts are warrants of constant activity. Such ‘generators of activity’ have a dual relation to the city: being attracted by its users, and thereby attracting even more users. As the city becomes ever more hostile to the spontaneous and improvised character of these generators, ‘Beirut field’ effectively taps into this potential to intensify the activity of the space. Kaak and fruit sellers turn benches and shelters into picnic spaces while light poles become late evening meeting spots. Cars are an intricate part of public life in Beirut. They are not only a mere means of individual and collective transportation. Often they are a pretext for the emergence of an improvised ‘public’ space, acting as an elemental interface between the private and the public. It is in or around parked cars that people and surroundings interact. Parked cars are permanent spots of activity, attracting coffee and tea sellers, amplifying the activity of the space. Dbayeh Marina, Raouché and the Corniche are speaking examples of this intricate, local relation that unifies cars, people and the urban space. As the city merges into ‘Beirut field’, so do cars floating between the topography of the space and its confetti of elements. They intermingle with the street vendors, trees, people, improvised markets. Next to benches and under rain shelters, parked cars turn into instant coffee parlours where stories can be exchanged over an ‘argileh’. At night, light poles are the setting for pimped cars to be shown off while blasting the latest pop songs into the open. Fishermen along the corniche evince the intricate relation between the city and the sea. Lebanon’s coastal cities such as Saida, Sour and Tripoli still harvest a tradition of fishermen selling their day’s catch directly as they dock in the harbour. They are a constant attraction for the casual passer-by and for those living on the coast. As ‘Beirut field’ forms an instinctive continuation of Beirut’s corniche, it extends far into the sea. Fishermen lay out their nets only a few meters from the shore. This sudden proximity of the sea is amplified by fishermen selling fresh fish as they dock their boat on one of the bollards on the shore. Two small bays provide shelter giving way to improvised markets, extending towards the built-up finger of ‘Beirut field’. ‘Beirut field’ uses the relation between everyday elements, activities and users of the city, to create a space in constant flux and negotiation between city, its citizens and the sea. The space is not thought of as a constant intensity and a fixed set of activities, but takes the city a priori as a public space and applies its mineralised surface, its constant decay, and the elements that guarantee its ongoing activity to the Normandy landfill.